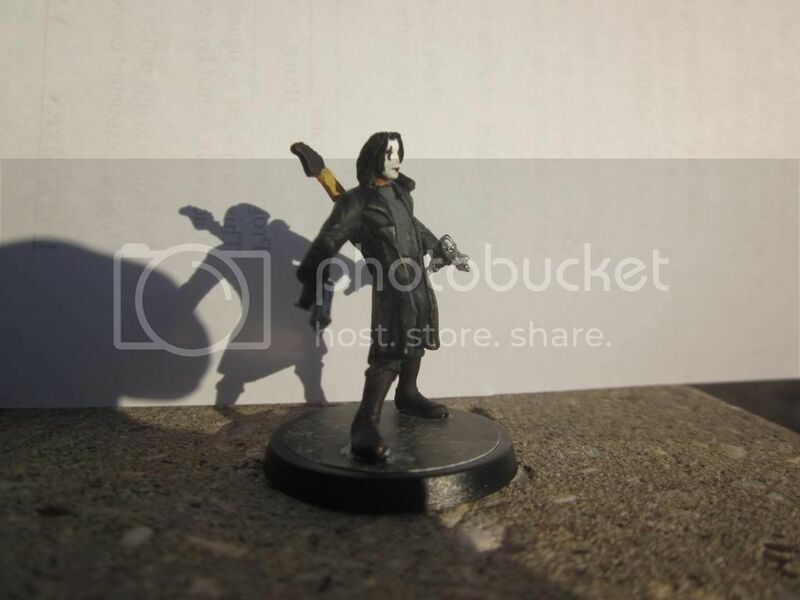 The figure used for this unit is a MODIFIED Heroclix figure from the Giant Size X-Men set. Its model number and name are #016 / Aaron Stack. 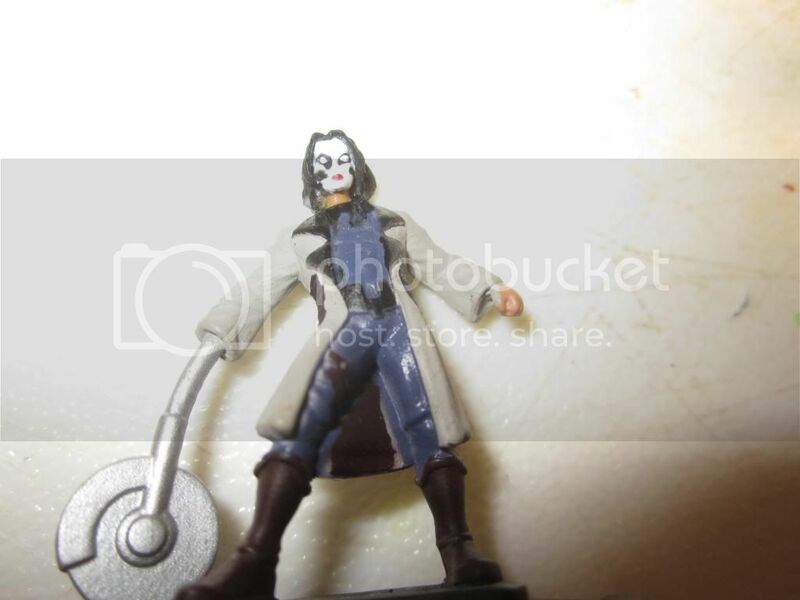 Character Bio - "People once believed that when you died, a crow took your soul to the land of the dead.....but sometimes, just sometimes, the crow could bring that soul back, to make the wrong things right..."
Eric Draven had a loving fiancée, a career with his band, and a genuinely happy life. That all changed when a random act of violence took both his, and his fiancée's life. Exactly one year after the tragedy, a crow landed on his gravestone. Coming back to the land of the living, Eric, empowered by the mystical Crow, hunts down the entire gang that took his fiancée and his life away from him. As an Undead, the Crow has these Undead Synergies. As an Undead, The Crow cannot be affected by aspects of certain special powers. Current Special Powers that Interact Differently with Undead. As an Undead, The Crow interacts differently with certain special powers. Current Special Powers that Interact Differently with Undead. Last edited by Ronin; February 17th, 2018 at 06:42 PM. Start the game with the black Crow Marker on this card. If the Crow Marker is on this card and any other figure you control is destroyed by an enemy figure, you may place your Crow Marker on that enemy figure's Army Card. If a figure with your Crow Marker on its card is removed from the battlefield or your opponent loses control of that figure, place your Crow Marker on this card. While your Crow Marker is on another Army Card, if The Crow would receive one or more wounds, ignore one of those wounds. Any Unique Hero with your Crow Marker on its Army Card rolls one fewer defense die. When The Crow attacks, he may attack one additional time. Last edited by Arkham; February 2nd, 2018 at 12:18 PM. Plenty of wording clean-up, including introducing the Crow Marker before referring to it, but we can work on editing later. Yeah, I went through a few different drafts of these powers before coming to this, so I'm sure there's some residual shmuck in there somewhere. Hadn't thought about introducing the marker. Have we always done that? 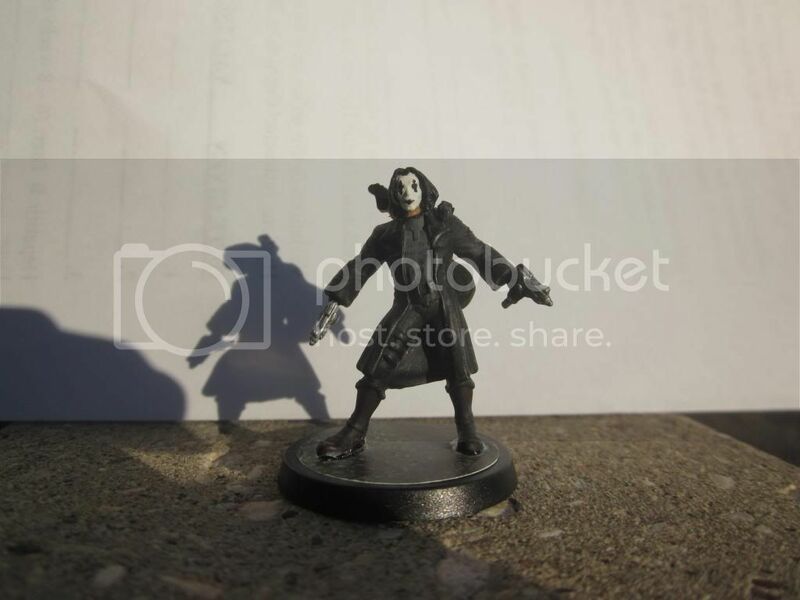 The Crow figure is actually quite simple. 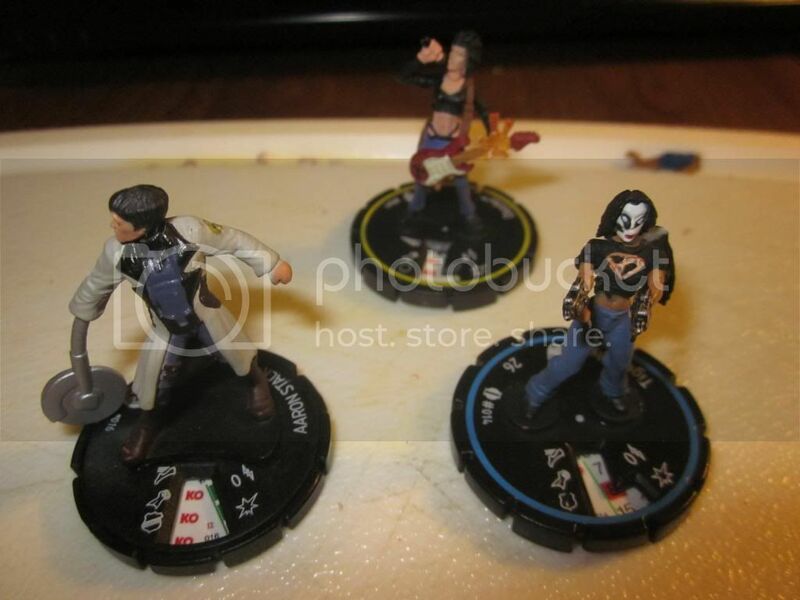 First of all, you need a Aaron Stack figure, a Tiger Lily, and a Dazzler (Optional). Cut off Aaron and Lily's heads. For Lily, you'll need to play with the back of her hair, so that it looks a little less than shoulder length. It's a lot easier than it sounds! Then replace the hands with Lily's guns. 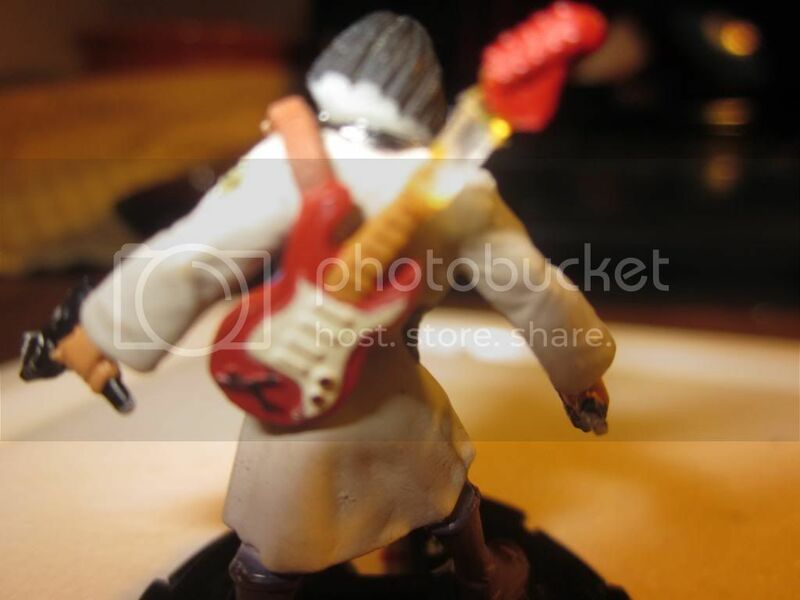 For the Dazzler figure, just clip off the guitar if you want some added awesome! Where her hand has the little explosion, I actually cut that off, then shaved down the whole explosion to about the same size as the rest of the guitar neck, then glued it back together. Bend the strap down his shoulder and glue it into place. It won't want to bend at first, but with superglue, it stays just fine. Rebase, repaint, and you're done! The paint job is simple, too. Black for most everything. I gave him a grey shirt for some variance. His face is white (Neck still tan), and then add his makeup over his eyes and mouth! (Can easily google pictures of his face for reference!). Last edited by Lord Pyre; March 6th, 2013 at 12:59 PM. 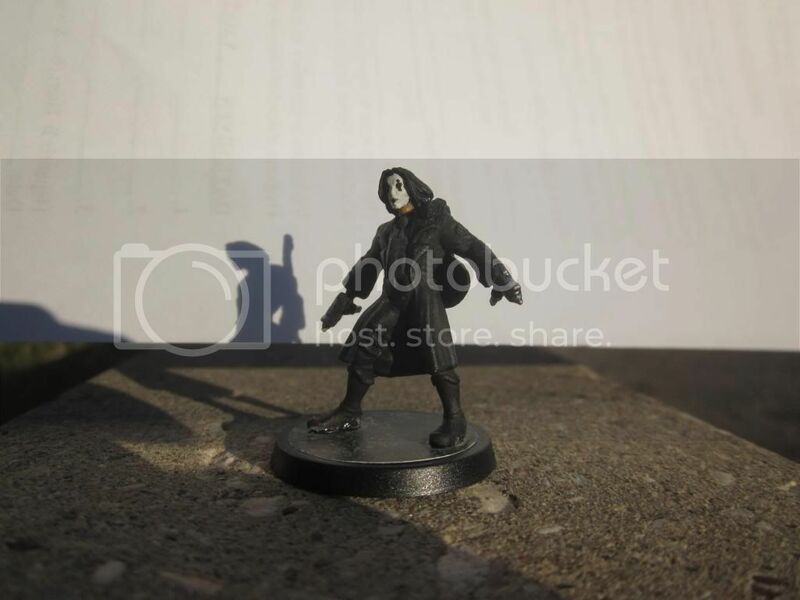 Whenever one of your figures is destroyed by an opponent’s figure, and the Crow Marker is on this card, you may place the Crow Marker on the Army Card of the opponent’s figure. The Crow rolls adds one additional attack die against the a figure with the Crow Marker on its card. 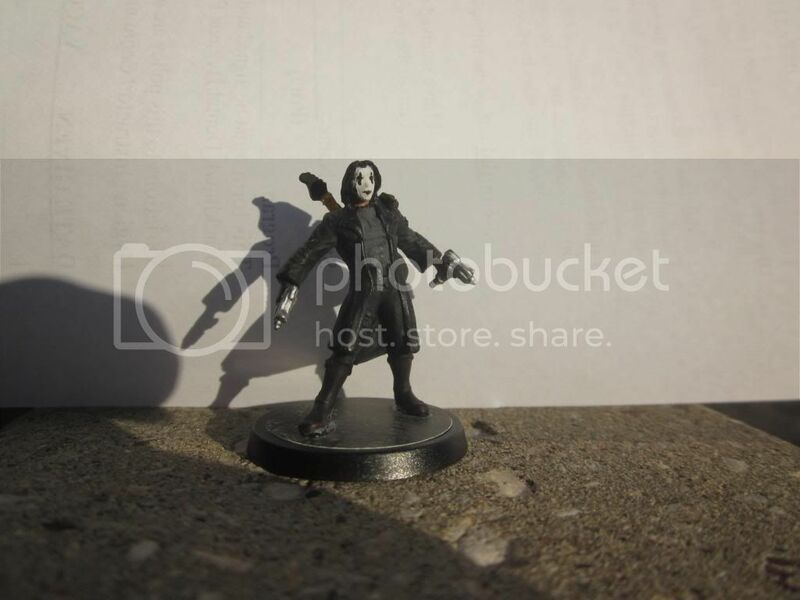 While the Crow Marker is in play, The Crow may not be destroyed by taking any number of wounds. If the figure with the Crow Marker receives 1 one or more wounds from an attacking figure, after that figure’s turn place the Crow Marker on this card. While the Crow Marker is on this card, and the Crow receives 1 one or more wounds from an opponent’s attack, roll the 20-sided die. On a If you roll 1-4, remove all Wound Markers from The Crow’s card, and remove the Crow Marker from the game. There's a lot going on with the Crow Marker in these 2 powers, so it would be really helpful to know where it starts the game. Is it on this card or not? Because the first power talks about what happens when the marker is on this card, but we don't know how it got there. Does that make sense? What do you mean by "may not be destroyed by taking any number of wounds?" There has to be a way to destroy him. High rolls are used for when good things happen, so getting to remove all Wound Markers should be on 17+, not on 1-4. Last edited by SirGalahad; November 24th, 2012 at 02:45 PM. While the Crow Marker is in play, he can't be killed by taking any wounds. The bird is his tie to the mortal world. Once the bird gets killed, then he becomes mortal. He can still take wounds before, since that's how you kill the bird, so once it's gone, you remove all wounds, and he basically is just human. Therefore it's a bad thing, so 1-4 roll. 2) The Crow receives one or more wounds, you roll 1-4 on d20, remove all Wound Markers from the card and the Crow Marker from the game. 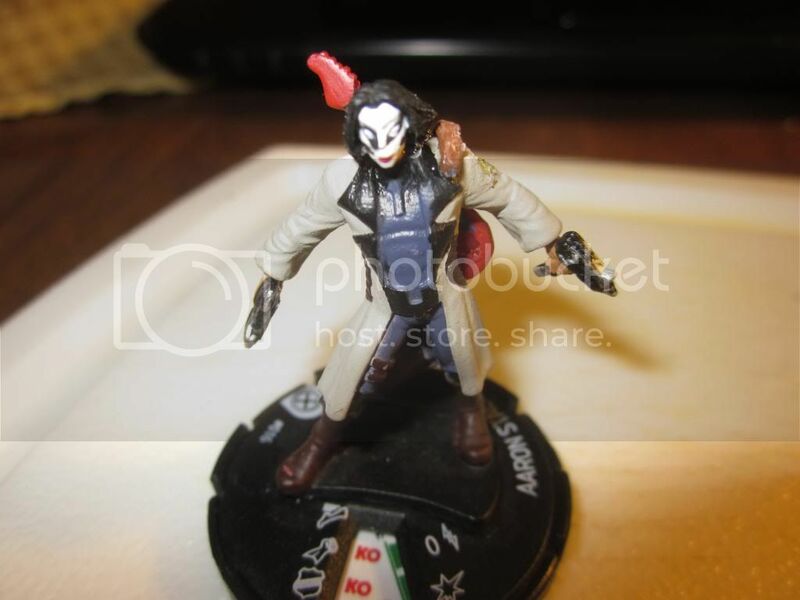 3) The Crow receives 4 wounds without the Crow Marker in play. Yikes. I don't know that I'd ever want to play against him. And you haven't differentiated between common/unique or squad/hero. Does he get the attack die against all the common squad figures if one of them destroys one of your common squad figures? Ideas are good I will let you & SirG work out the wording.